The Raloy RD119 rack console features a 19" LCD with Dual Slide rails - independent slides to allow the monitor to remain accessible while the keyboard is stored. The RD119 is the ultimate rackmount keyboard/monitor solution, providing a keyboard and mouse console, an independently accessible LCD panel and optional KVM into a single unit taking up only 1U (1.73 in.) of server rack space. 1U rack console drawer w/ dual slide rails: retractable keyboard & independent LCD display. 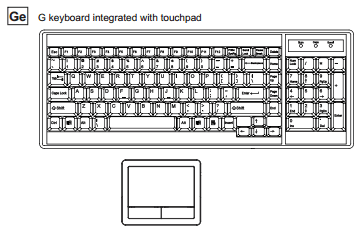 Full 104 key notepad keyboard w/ number pad and integrated touchpad (available in 13 international languages). Mix PS/2, USB & SUN with Multi-Platform switch capability. Modular for a highly customizable rack console - integrated KVM, peripherals & more. New easy to maneuver front handle with two point lock system. 6-foot combo cable included (RCE-6). Warranty - 24 months Parts & Labor. Package Dimensions 23.4 x 33.9 x 5.5 in.